Darkness comes, the sun sinking low on the horizon. Deep in the forest, shadows creep across the ground, slowly engulfing all that is before them. High in the treetops, something stirs. A pair of yellow, hypnotizing eyes is all that can be seen through the inky black of night. This mysterious mammal waits, perched on a branch, using its tail to balance. Never stirring, barely blinking, it waits. Leaves begin to rustle below the tree and the animal pierces the darkness with its sharp nocturnal vision. Like an acrobat in a circus, the creature leaps. Flying gracefully downward, it locks its jaws on a wild boar’s neck, severing the jugular nerves. Carefully, the victim is carried up a tree. Dinner is served! As the first light hits the treetops, the acrobat crawls over to a small opening in a rock. Nestled inside are two balls of spotted fur. They stir, then slink over to their mom and slowly begin to suckle. Once every drop is gone, mom climbs back up to her favorite branch above the den and lies down, alert and ready to keep watch. Finally, the golden rays stream through the leaves and shine upon the coat of the mysterious mammal. A secretive, majestic clouded leopard is revealed. Rippling muscles, cloud-like spots, a long tail, and sharp vision all helped the clouded leopard hunt. During the day she will sleep, digesting her food on her branch. When the night comes again, and darkness consumes the forest, she will awaken. Stealthily sneaking up on her prey, again she will pounce on the unsuspecting victim and again her dinner will be served! My spots help me hide. Upon them I will lie. As I wait for prey. I’m done hunting for the day. Like an oar or a paddle. With no need to wail. I know my own way. I'm so thankful Point Defiance has Clouded Leopards. It's great to know you don't have to travel the globe to see them and you can actually do something right here in Tacoma to support their existence. The clouded leopard (Neofelis nebulosa) is a medium sized cat with cloud shape spots on its coat, hence the name clouded leopard. It is the only member of the genus Neofelis, separating it from other big cats like tigers, lions, jaguars, and other species of leopards. Cloudeds are an Endangered Species, meaning that there aren't as many as there used to be and the ones that are left are protected to hopefully bring back the species. With their declining numbers in Southeast Asia due to poaching and deforestation, they need all the help they can get. Point Defiance Zoo actively participates in the Species Survival Plan (SSP). The SSP is a program to help Endangered Species recover by pairing animals together to help create a diverse gene pool. Point Defiance currently has two Clouded Leopards, Raja and Josie. If you're lucky, you can see them in the back exercise yard next to the Wild Wonders Outdoor Theater. With your continued support to the Clouded Leopard Project, hopefully we'll see their numbers increase and perhaps Point Defiance Zoo will build a public exhibit for their existing Clouded Leopards. I have been thinking about ways I could save the clouded leopards and other endangered animals. 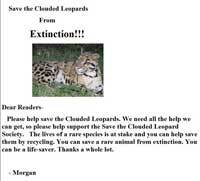 One way I thought that I could save the clouded leopards is to make filers and I did, after I did I handed them out at school and some of the teachers are supporting me and other people believe. Sometime I wish other people cared as much as we do. When the world starts to change I’ll be here waiting on it. I do a lot of research and I found out that the clouded leopard is not the only animal close to being extinct. There are other animals like the panda or the black leopard. 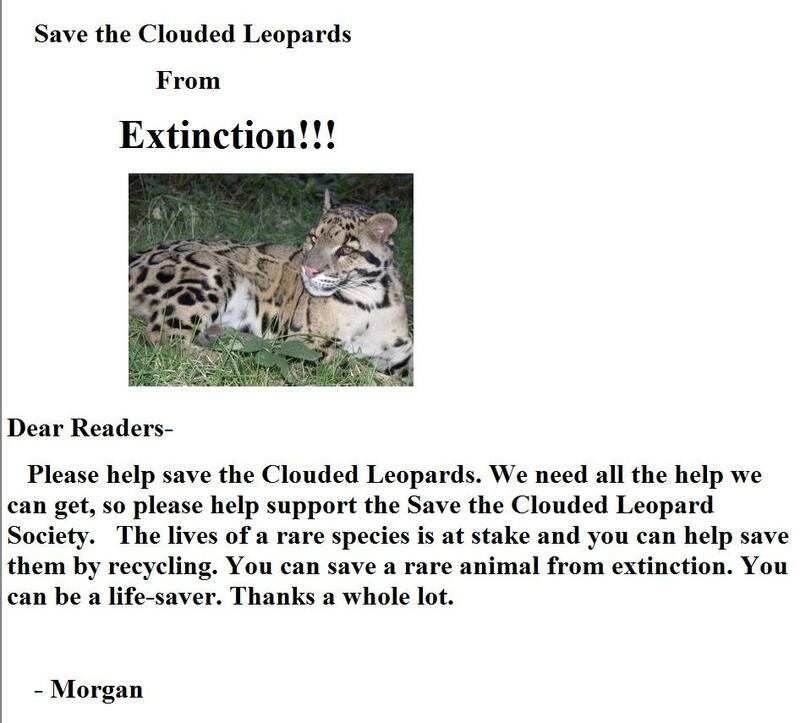 So I wrote an article about the clouded leopards and the other animals and I'm going to hand those out with my other fliers that I made.